ESA’s space probe Rosetta identified new jets of gas and dust emerge from the comet 67P/Churyumov-Gerasimenko. The images were taken using the OSIRIS camera on March 12, 2015 and were presented last week during EGU2015 (European Geosciences Union General Assembly 2015) in Vienna. The activity on the comet keeps on increasing but it took some luck to detect new jets. 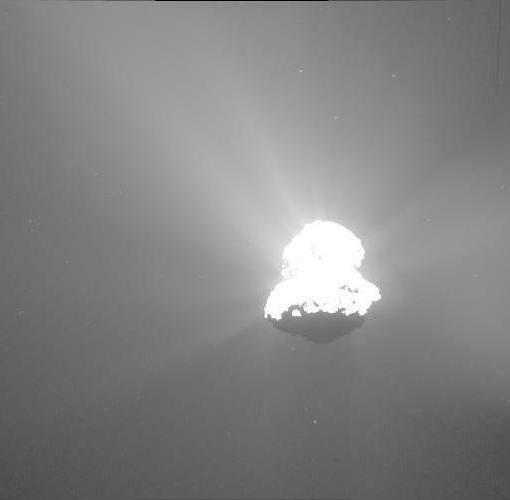 The frozen gas on the comet 67P/Churyumov-Gerasimenko are sublimating because of its approach to the Sun. The jets that ensue bring dust particles with which they are forming an increasingly dense coma. In the comet’s area facing directly towards the Sun, the jets are significant, so much that in its last flyby caused problems to the space probe Rosetta. On March 12, 2015, Rosetta was about 75 kilometers (about 46.6 miles) away from the comet 67P/Churyumov-Gerasimenko and its OSIRIS camera was capturing various images of the jets of gas and dust. There were several of them on the top side of the comet, illuminated by the Sun. The photograph taken at 5.13 UTC shows no jet coming from the bottom, dark, area of the comet 67P/Churyumov-Gerasimenko. The photograph taken two minutes later shows instead a new jet emerge from that area. It was a stroke of luck because it’s impossible to predict when and where a new jet will emerge. The fact that this new jet came from an area that was in the shadows is surprising. Dawn was coming and perhaps the first rays of the Sun had already hit some part of that region remained hidden to the space probe Rosetta because of its orbital position. It’s also possible that the new jet was caused by some more explosive activity. For example, a heat wave may have reached the ice in a deeper layer below the surface. At EGU2015 another discovery was also presented. Measurements taken by the space probe Rosetta and the data collected by the lander Philae, that still is giving no signs of life, show that the nucleus of the comet 67P/Churyumov-Gerasimenko is not magnetized. It’s the first time it was possible to make this type of measurements on a comet thanks to the fact that Rosetta has approached a lot to its target and to the lander. The mission of the lander Philae was unlucky in many ways but the fact that it bounced on the surface allowed it to carry out measurements of the magnetic activity of the nucleus from various areas using its ROMAP (Rosetta Lander Magnetometer and Plasma Monitor) instrument. These data have been added to those detected by Rosetta’s own magnetometer. Data sent from Philae were useful for this study on the nucleus of the comet 67P/Churyumov-Gerasimenko and in the meantime Rosetta continues its mission from the orbit. ESA’s scientists are assessing the next maneuvers in order to limit the risks to Rosetta. The data already collected keep on being studied but surely more very useful will come.